Have you ever noticed that most soups go from chopped vegetables to pre-warmed soup bowls in less than an hour? That is unless you are venturing into the makings of a slow cooker cabbage soup which takes up to 6 hours of your non-presence. Either way, you are bound for a heart-warming treat at the end of the day, hopefully with enough leftovers for easy to reheat lunches, or even to freeze for a later date. In winter months we could all use a little garlic, ginger and turmeric in our lives. 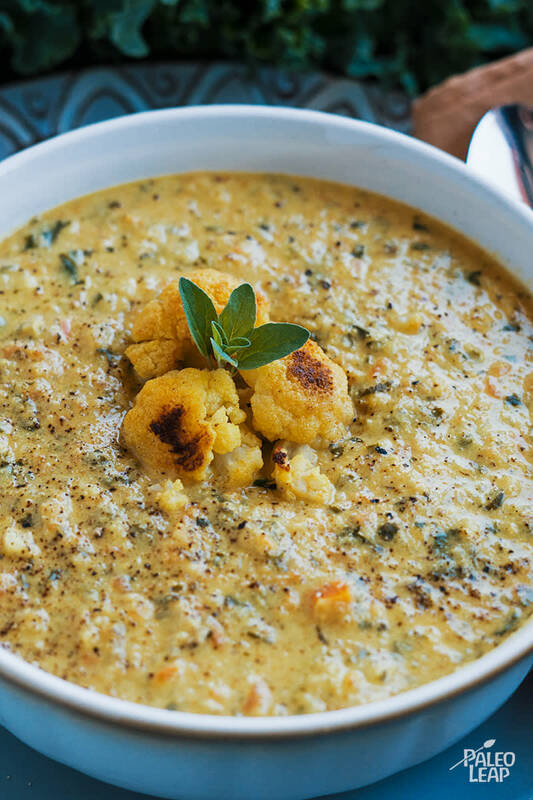 All three of these ingredients help us to boost our immune systems in times of need, and as luck would have it, all three reside in this curried cauliflower and kale soup. If you aren’t familiar with many benefits of turmeric, you should be. You may recognize it by its intense golden color and if you have ever gotten it on your hands, you know that it stains temporarily (as a side note it can be used to whiten your teeth), but in all of its superb yellowness it is most renowned for its anti-inflammatory effects. Tastewise, turmeric brings depth to whatever stew, soup or curry you are indulging in. And if you can find it in fresh version, it even makes a wonderful addition to a ginger and turmeric orange juice. With this soup, you truly can go for gold!